Make your dog's stay more comfortable! Kuranda Kennel Beds give your dog a lift off of cold hard floors. Their cot-style bed offers comfort and provides relief for a dogs' joints. The heavy duty vinyl is our most durable option. It is exceptionally durable and easy to clean and sanitize. 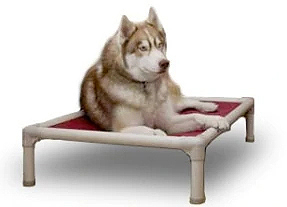 Great for adding rest areas to lodging or doggy day care areas! 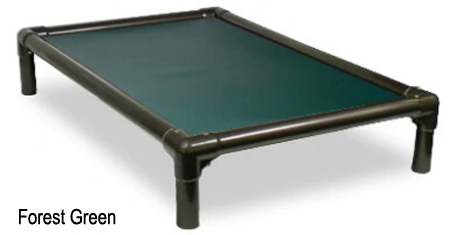 PVC Frame and legs with anodize aluminum top corner brackets to reinforce the most abused part of the bed in a kennel. Kurando Bed with Burgundy Vinyl and Dog. * Prices are subject to changes. Please call for confirmation or with any questions.